Barometric pressure, or atmospheric pressure is the pressure exerted by the weight of the air in the earths atmosphere. At sea level the atmosphere exerts 14.7 pound per square inch (PSI) of force. 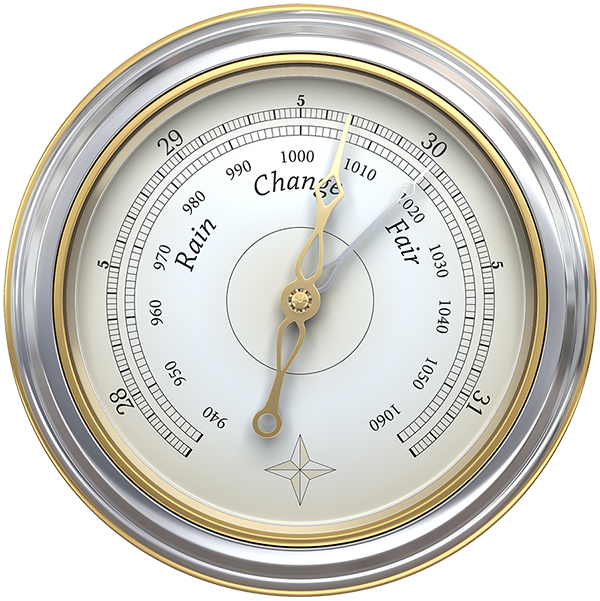 Barometric pressures is measured with a Barometer and reported here in inches of mercury and millibars (29.92 and 1,013.25 respectively for average sea level). This force is not perceive by humans since our bodies are are full of of air, which exerts and equal outward force, and made of non compressible substances like water. There are times when you may perceive changes in barometer pressures, such as during takeoff or landing on an airplane. The air pressure in an airplane becomes less that sea level as its altitude increases (around 11 PSI) so as the air in your body adjust to equal the pressure of the surrounding air your ears may pop. This can also be experienced when driving up or down a mountain road or in a fast elevator. Barometric pressure varies across the earth surface. These pressure differentials are the driving factor controlling weather. High pressure is generally associated with nice clear weather, while low pressure is generally associated with cloudy, rainy, or snowy weather. Therefore falling barometric pressure usually indicates an approaching storm.